Some of you might have already noticed the new “Follow by Email” Gadget on your “Add a Gadget Page”. The gadget is pretty simple and easy to install. 2.On the next window click on the plus sign, and you will be taken to the gadget options page. 3. Click the save Button and you are done. You are done now!! :) Wasn’t that simple? You can track your subscription information from your FeedBurner Panel. Though this gadget has got a simple easy to use interface, the gadget is really intelligent, and does lot of background work and synchronization. It checks if you have already burnt your blogger feed, and if you have, then it retrieves your Feed burner URL automatically. If you have burnt the feed but hadn’t enabled the Email Subscription option for your Feed, then it automatically enables the same. If you haven’t even used FeedBurner before, then it automatically burns your blogger feed, and retrieves the new FeedBurner url of the new feed that was generated. Oh!! I hate the url that FeedBurner gave me. 3. Change the Feed Address to something pretty! What do you think of this new Gadget from the Blogger Team and what tweaks would you like to see on this gadget? I think its a pretty handy little gadget to add to a blog, I've added it to my blog although I'm not sure if I'm that popular that people have added their email address to it. Hey, how do I find who follows me by e-mail? @Alexys - Login to feedburner.com, Click on your Feed,Click on "See more about your subscribers" and on the next screen, click "FeedBurner Email Subscriptions" under "Email Subscription Services"
Thanks for this gadget. I've just added it, so we'll see how many of those people who wanted email instead of a blog find it. That's what I was waiting for. Actually i hated to go to feedburner and then do that boring stuff to add an email subscription box to my blog. But, now with this widget it's much simpler. i was waiting for such a nice gadget for a long time! its feels great to me.. This is another cool gadget for blogger, I just use it on my blog yesterday. Never know how to config on feedburn, thanks for sharing in dept instruction. 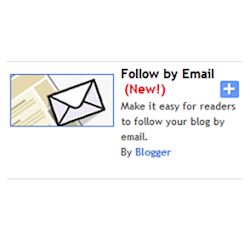 thanks for telling abt Follow By Email Gadget for Blogger. nice to learn new things! great post! Great share, I'm adding this into my blog now. I will be curious to see how many people go for it. I will let you know how it goes. Thanks again. Just a question .. how can a person unsubscribe from receiving the emails once they have signed up, if they no longer wish to receive the emails anymore? How long does it take (after publishing a new post) for the email notification to go out? Immediately upon publishing, or after some amount of time? I've added it successfully and people used it and it works. Problem is, no one received email notifications of my blog postings. So it didn't work for me. Any suggestions? Is it possible to change the tekst into my own language, and if so how? Just simply change 'submit' into 'verzenden' would bge enough. Sir. Me new to tech. Learning a lot here. Searching for a similar Gadget 'Contact by Email'. With Regards. Interesting technique you have Admin. You remove the url from the comment author names. i suggest you should mention this in your comments section that you wont be giving any dofollow backlinks to your daily visitors. Crap thing though! you just lost one here. @Psycho - you can click the profile pic to reach the user's blog. I don't see the need for 2 separate links.